In one of the biggest television events of the year, Conan O’Brien made his debut as host of “The Tonight Show” on Monday, June 1, which aired on NBC from its new studio in Stage 1 of the Universal Studios Hollywood back lot. Valencia, California-based ATK AudioTek has supplied a state-of-the-art sound reinforcement system at the studio, featuring elements from JBL’s VRX, SRX, VERTEC® and Control® Contractor Series. Jeff Peterson of Green Audio designed the system. 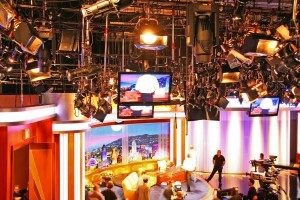 O’Brien’s debut on “The Tonight Show” featured guest actor/comedian Will Ferrell and musical guest Pearl Jam. Monday’s show generated the program’s highest ratings for a Monday in four years, 82 percent higher than the show’s average in major markets in the second quarter of 2009. According to Peterson, the sound reinforcement system needed to be of pristine quality, but visually unobtrusive. “We designed a system to provide audio that met the standards of both live performance and television broadcast, configured to blend in seamlessly with the set design,” Peterson said. The main PA system at the new Tonight Show set consists of left and right clusters, each containing four JBL VRX932LA-1 compact constant curvature array systems with one VRX918S subwoofer on top. A center cluster features three VRX932LA-1 loudspeakers. The system is enhanced by a center array of two VERTEC VT4880A full-size arrayable subwoofers. The system also features two delay clusters flown 40 feet downstage from the main PA system, each containing two VRX932LA-1 loudspeakers. Peterson’s system design features a unique approach to nearfield sound support, with a JBL Control 23 surface-mount speaker underneath every other audience seat in the theater for dialogue, creating an “under-seat” system of 178 individual speakers. Each row in the under-seat system is treated as an individual zone for signal-delay purposes, time-aligned to the main PA so they can be used in tandem. Onstage are 16 JBL SRX712M stage monitors for performers, four VRX915M stage monitors for drums, and two VT4881A compact arrayable subwoofer for the drum monitor system. Crown I-Tech 4000 amplifiers power the PA system, with high-powered I-Tech 8000’s driving the subwoofers. Crown I-Tech 4000 amplifiers power the stage monitor system. Signal processing for the entire audio system is accomplished via two BSS Soundweb London BLU 800’s, while the system is networked for remote control and monitoring with Harman HiQnet™ System Architect™ software.